About a week ago both Michael and I were in the midst of the main half term school holiday here in Méribel. 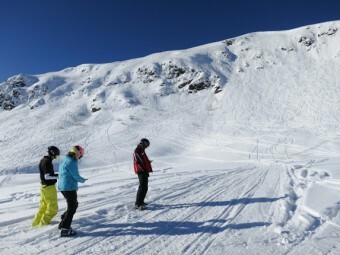 To some ski instructors this means a very busy and intensive period of group lessons. 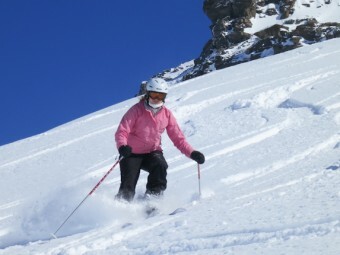 However because Michael and I prefer to work privately, ie away from ski school group lessons, we both very much look forward to delivering our private ski lessons during this period. 'Why is that?' I hear you cry. 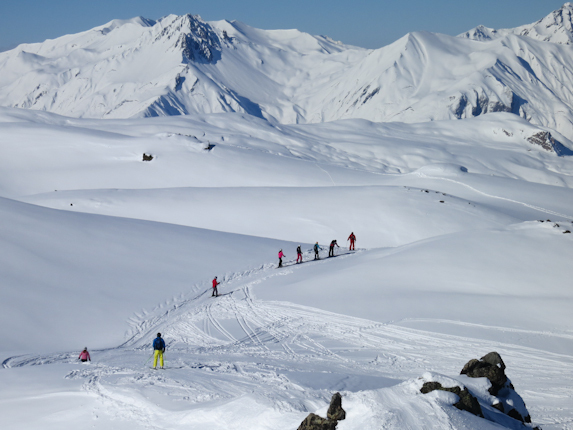 Over the last seven years I've skied with the Joneses, and their various friends and families, and there is never ever a dull moment when they are out in resort. Likewise Michael has skied with the Ramsdens for well over ten years. Skiing with families normally means we are mostly with the children. Personally I find it fascinating to see how the children grow and develop in stature every year, and of course I find it interesting to see how their skiing evolves as well. Needless to say Robbie and Olivia (Jones) are now cracking skiers and can ski any piste on the mountain. Their parents were really keen this year for me to take them to the next level, ie introduce them to the off-piste environment. I didn't realise until the start of half term that Michael and his teenagers were at the same stage as well. So Michael and I sat down with a drink one evening, discussed our goals and hatched a plan. 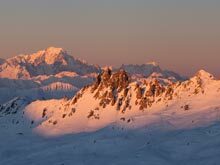 We decided to team up together on the Friday, run a session on the mountain, introducing avalanche kit and how to use it, then head off piste and try to find some tasty snow. I delivered a little chat on the transceivers, showed how a search is performed (ie looking for a concealed spare transceiver that was hidden from my view earlier), and then asked the teenagers to perform their own search. Here are Olivia, Robbie and his friend Hugo performing a search with transceivers in hand. After the training was finished we decided to go for a ski together. But you see the thing is, at that time we hadn't received any fresh snow for a week and a half. Plus all of the visible off-piste classics were completely tracked out due to this being the busy school holidays. 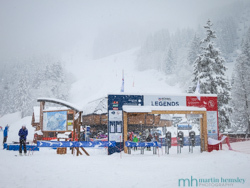 The pressure was on to find some nice snow! Our first route gave us a few nice turns in powder snow, but realistically the snow was on the whole 'educational', in other words quite challenging. We all had fun though and rushed to a mountain restaurant to have a hot chocolate and warm up. Our next route, off the side of Cime Caron in Val Thorens down through to the Lac du Lou into Les Menuires, was a different beast. 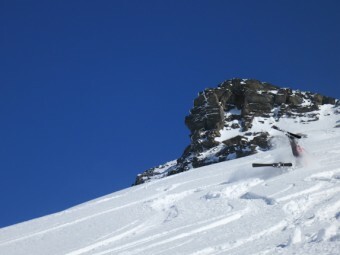 This was proper off-piste, without a piste or another skier in view, and guess what? 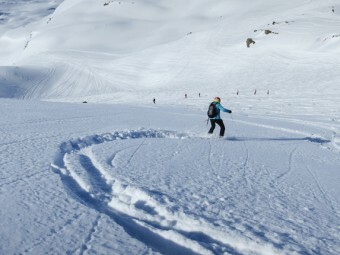 We found some lovely fluffy pow pow (otherwise known as powder snow if you are more grown up). You should have heard the screams of delight, and endless giggles. 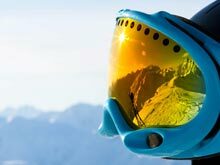 Some of you may be aware how different skiing in deep snow feels compared to piste skiing; it's a completely unique experience. A feeling that can get addictive. They all loved the experience, enhanced by a few splats along the way. For me the 'Splat Of The Day' came from Rory, it was priceless. 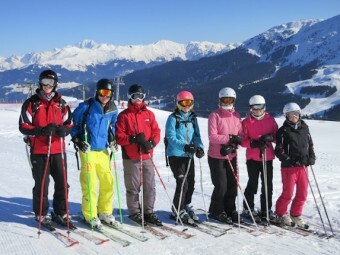 Olivia, Robbie, Hugo, Frances, Mel, Rory and Sarah all skied really well. I have a feeling that if they get the chance to ski in powder again in the future then I'm sure they will jump at it. Well done Team.